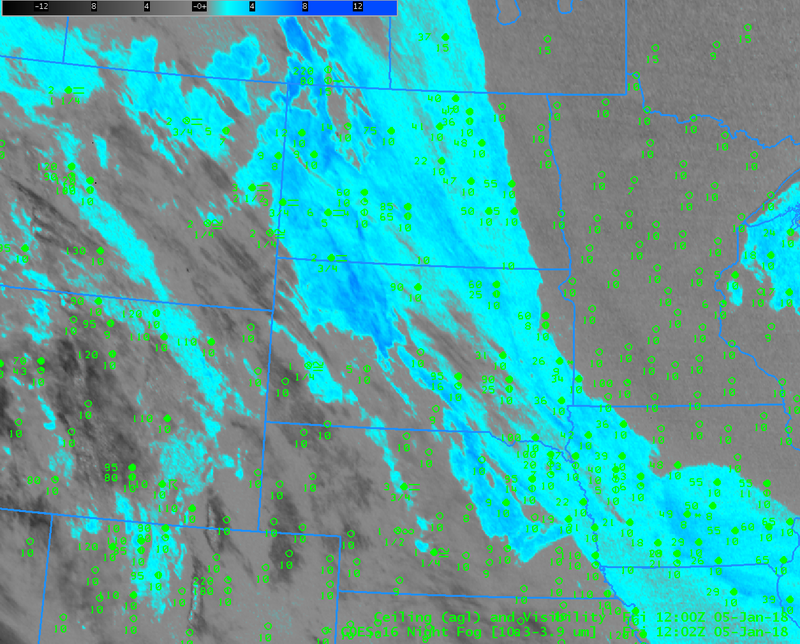 area roads and sidewalks as well. 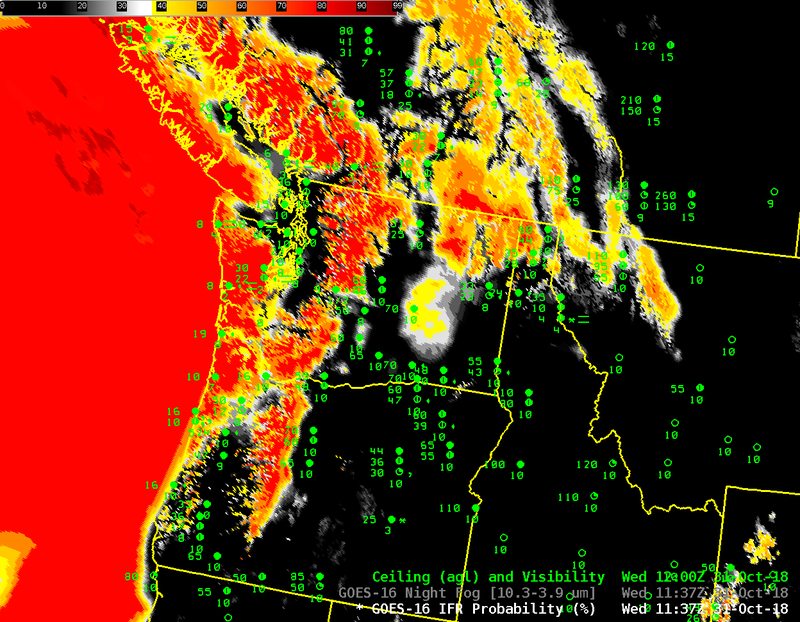 * Visibilities…as low as one quarter mile or less at times. 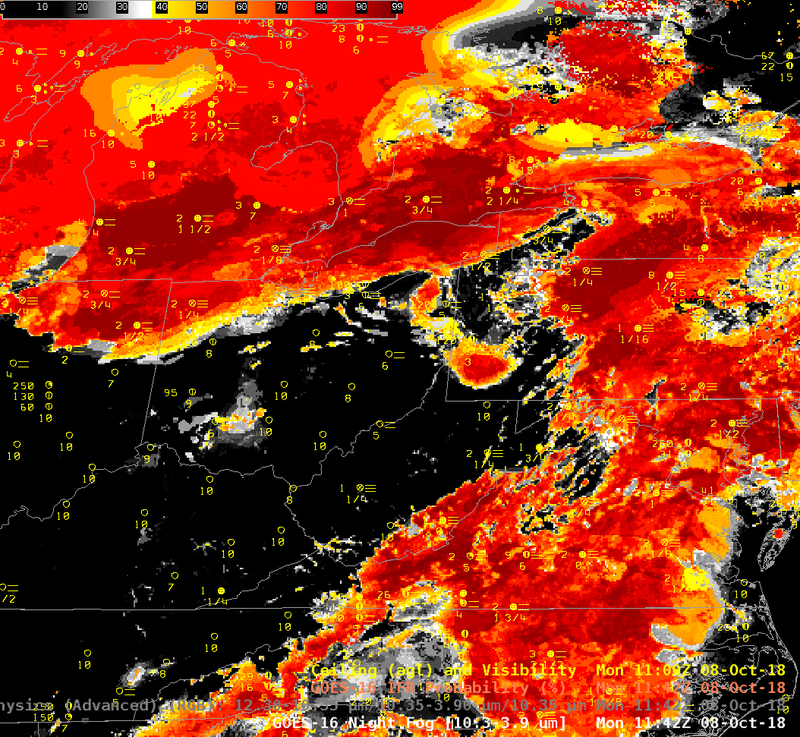 * Impacts…Hazardous driving conditions due to low visibility. 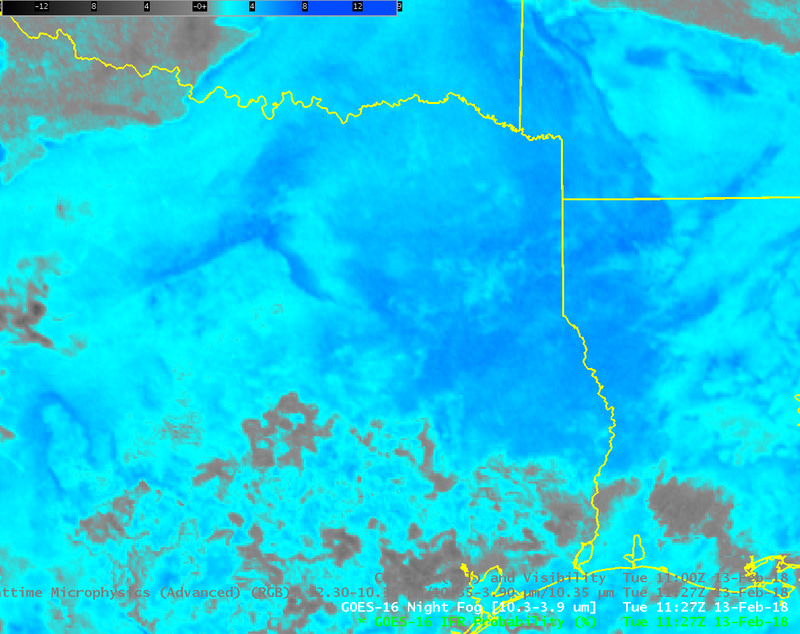 Fog may freeze on area roads and walkways as well. 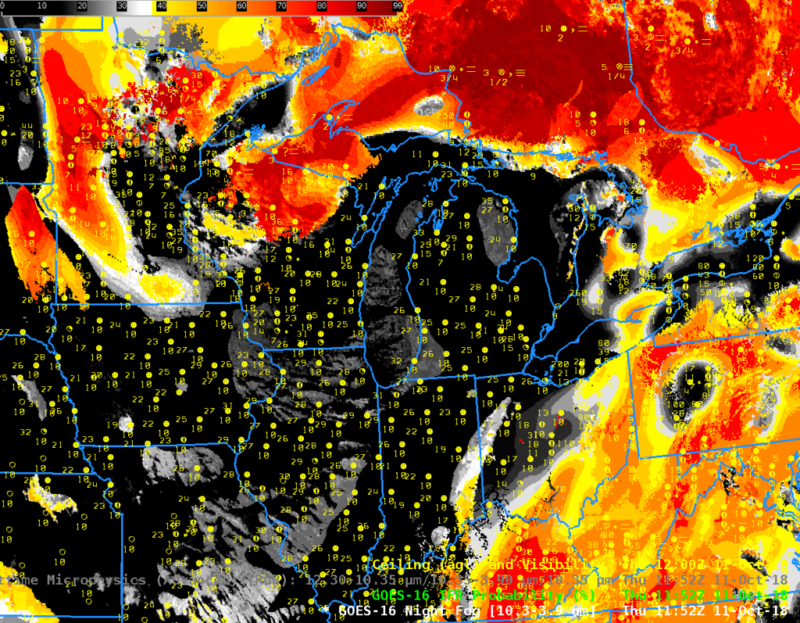 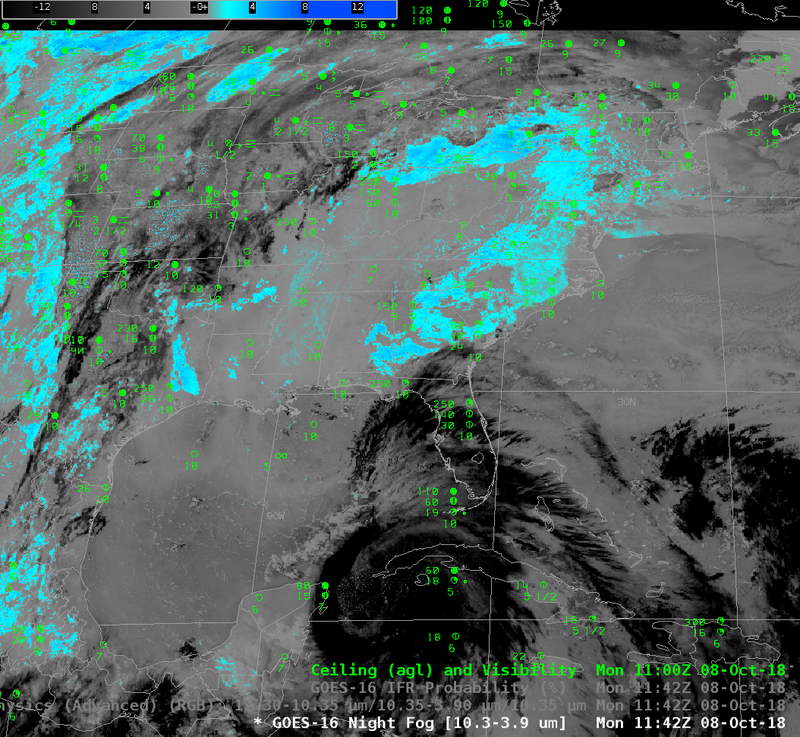 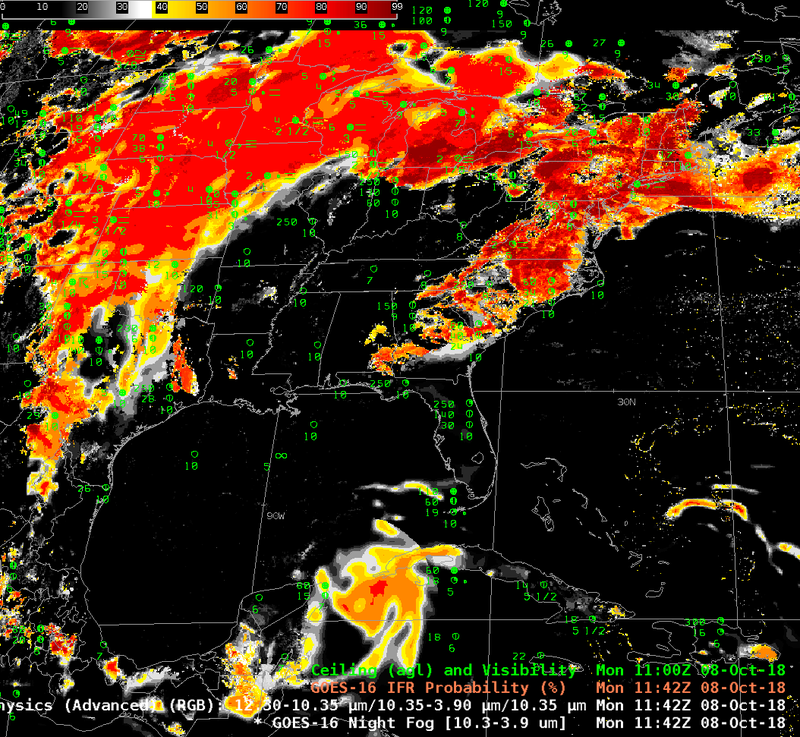 GOES-16 IFR Probability fields captured the development of these regions of dense fog. 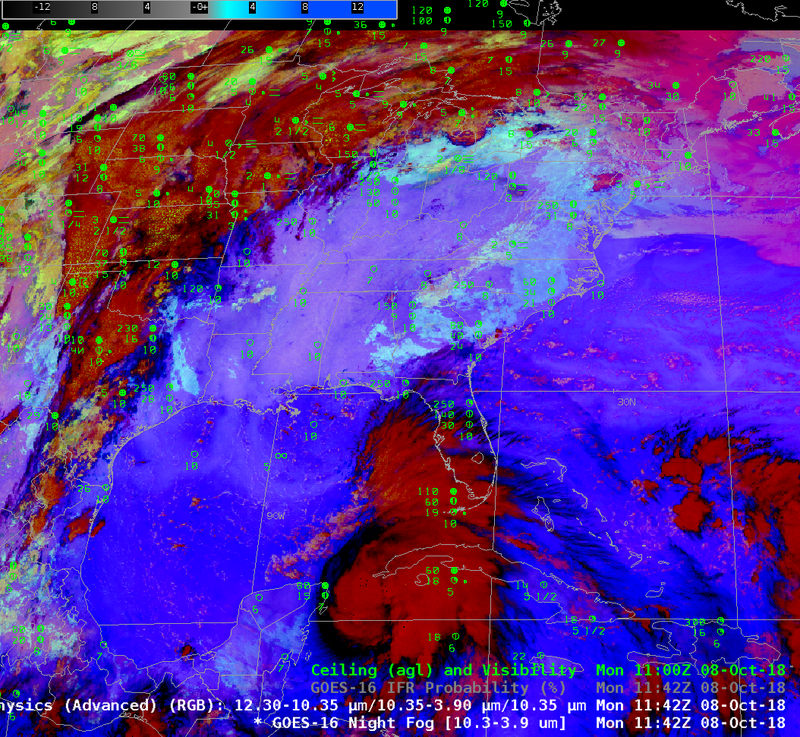 The animation from 0400-1200 UTC on 5 January is below. 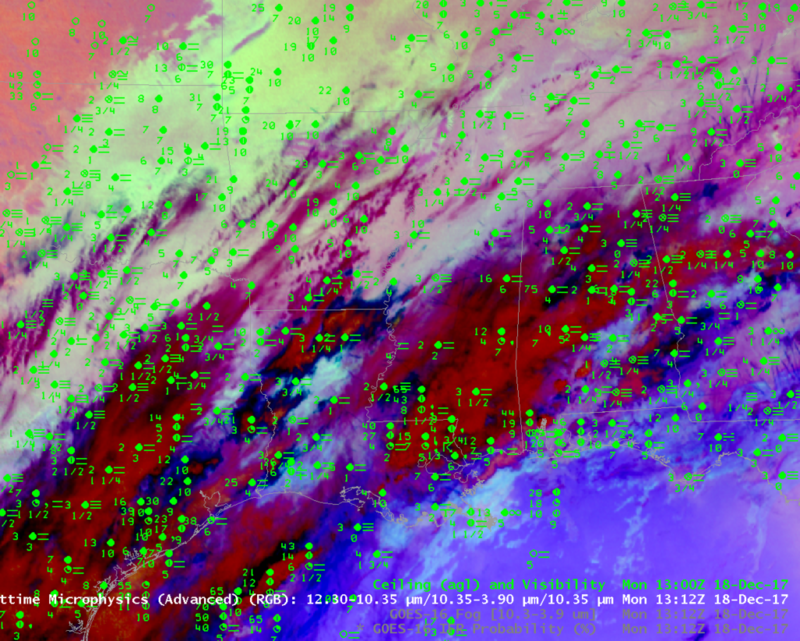 Highest values of IFR Probability are consistent in the areas where IFR Conditions are developing and where Dense Fog Advisories were issued. 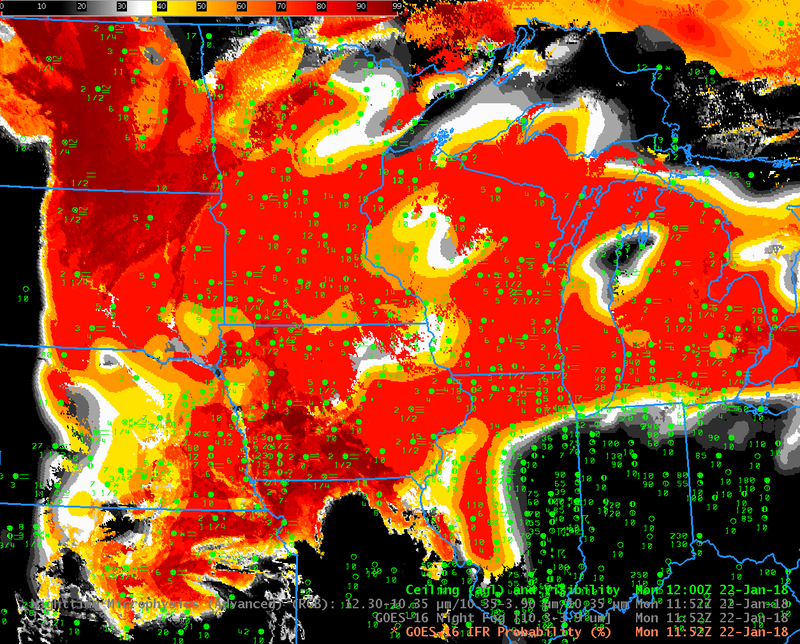 Note that IFR Probability fields are fairly high over Iowa and the eastern Dakotas, regions where mid-level stratus was widespread but where IFR observations did not occur. 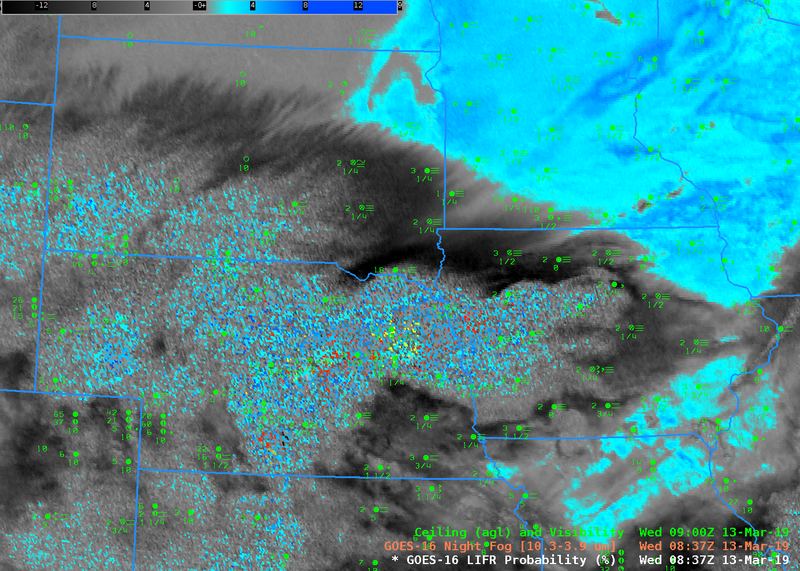 On this day, Low IFR Probability fields better screened out this region of mid-level stratus. 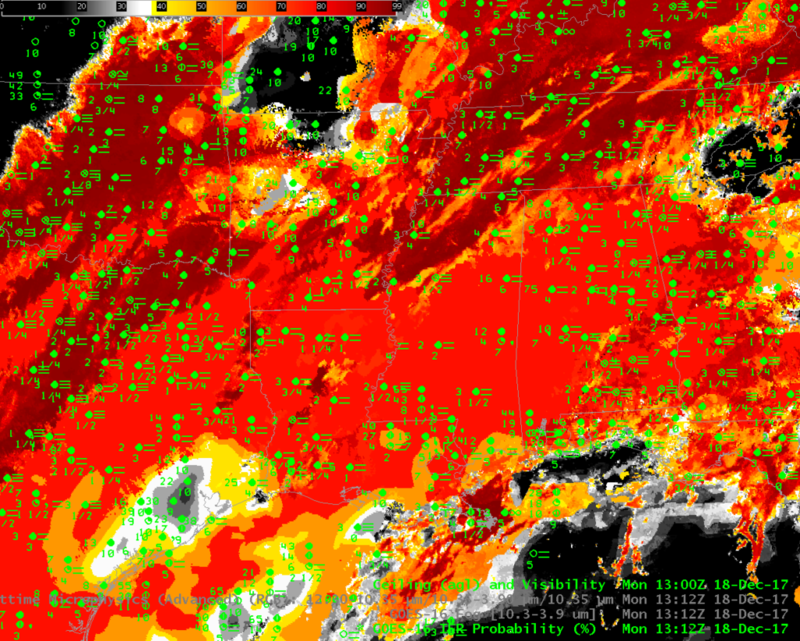 The toggle below compares IFR Probability and Low IFR Probability on 0957 UTC. 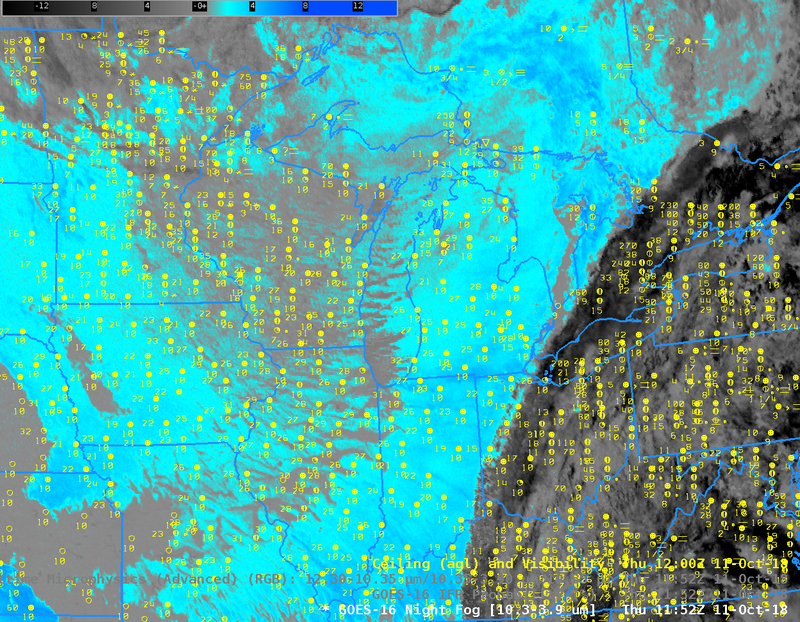 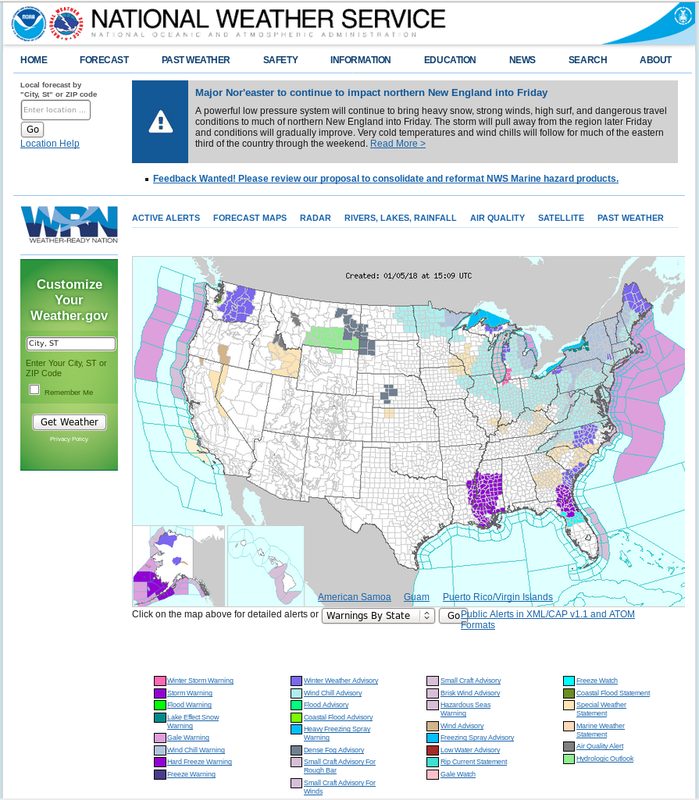 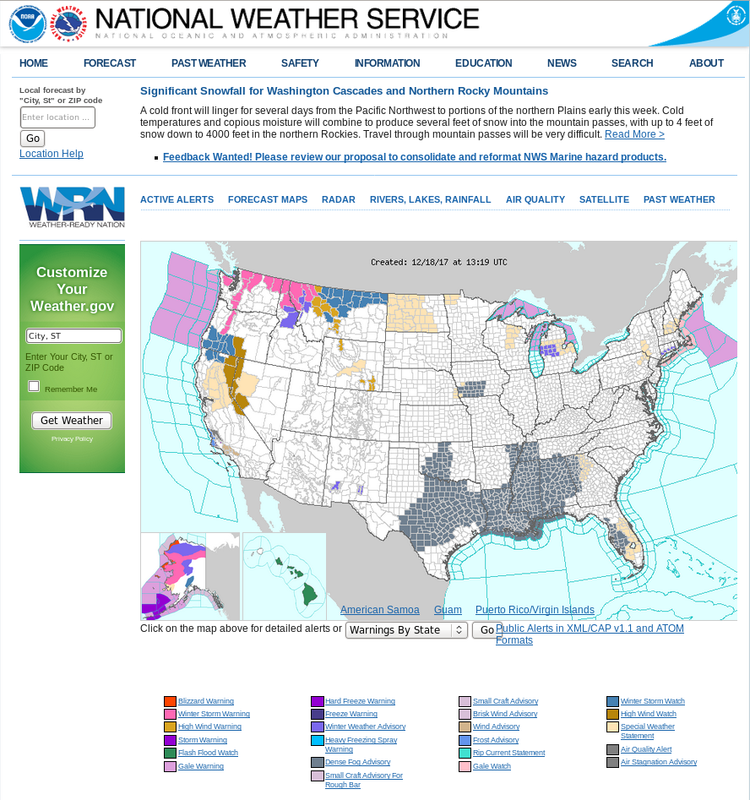 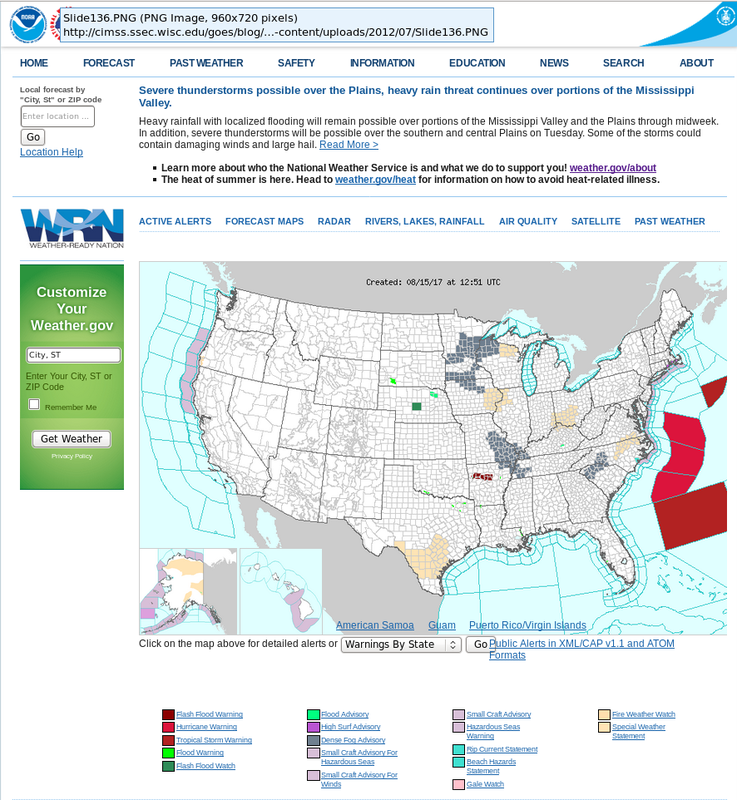 The region where dense fog advisories were issued shows high values in both fields. 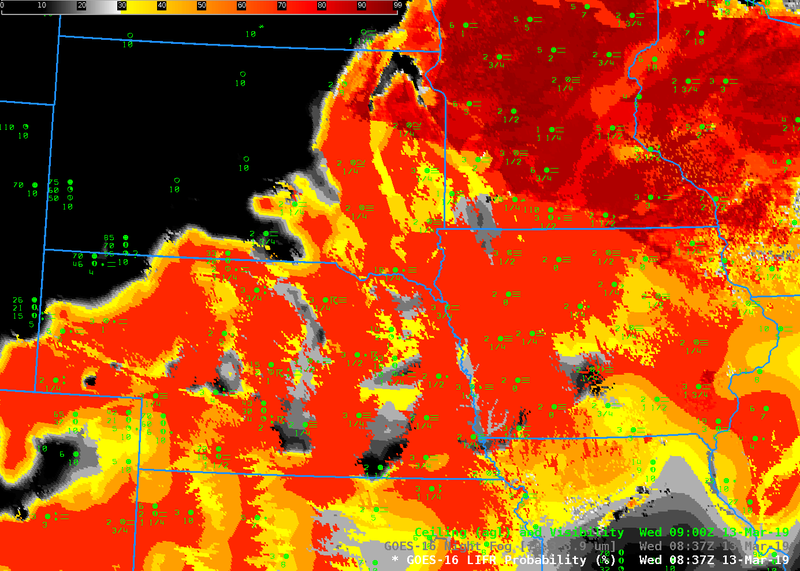 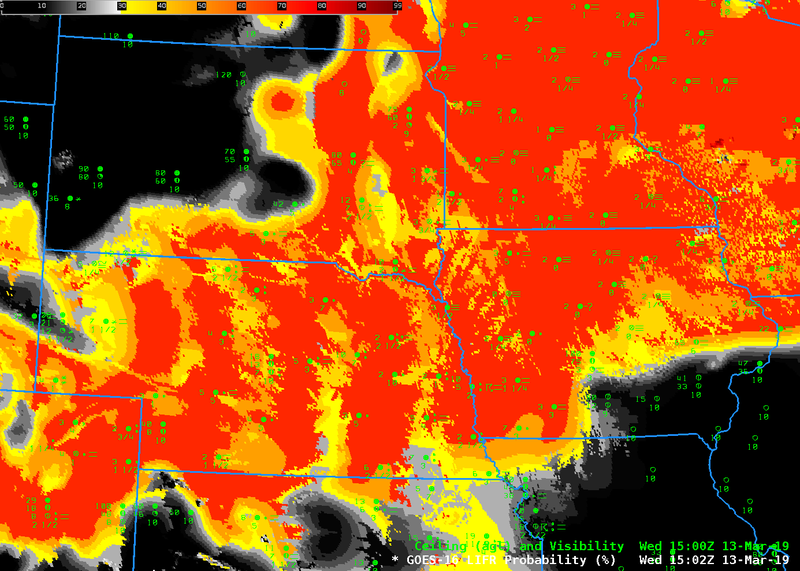 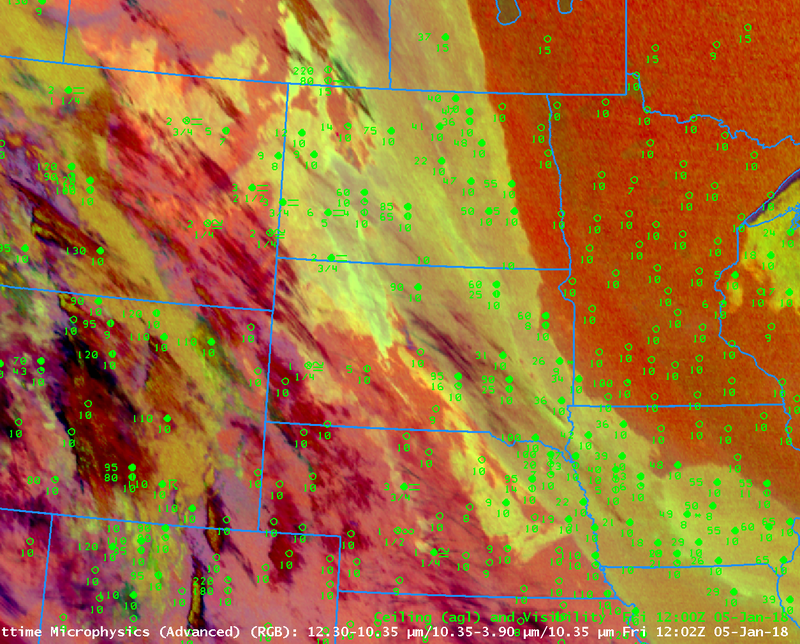 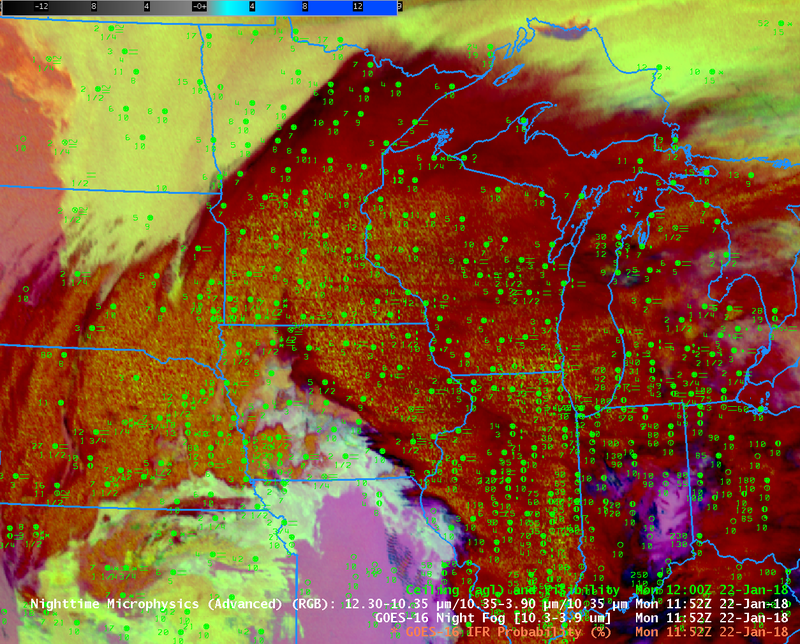 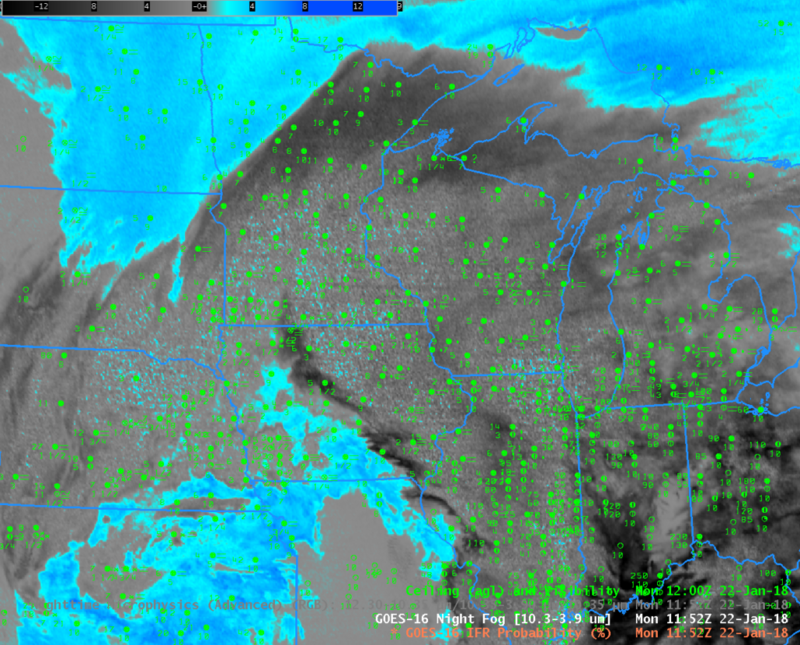 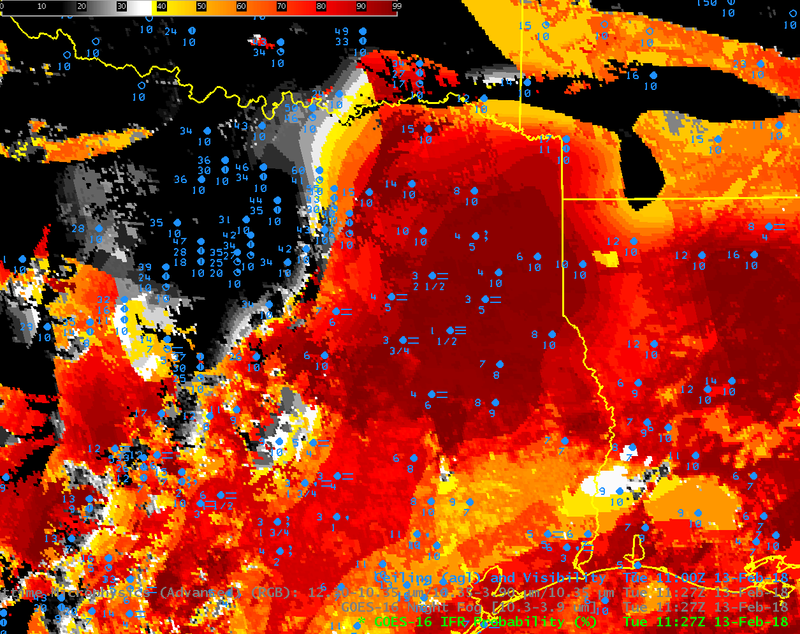 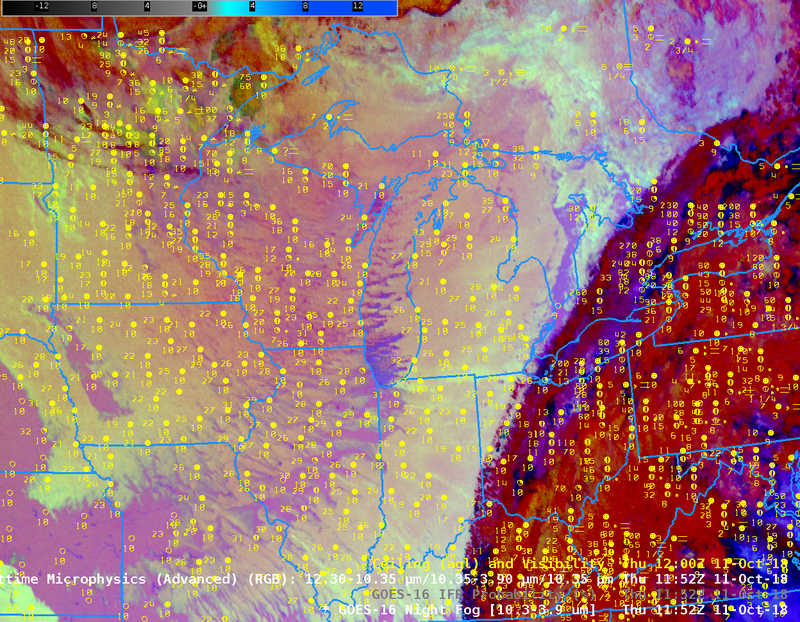 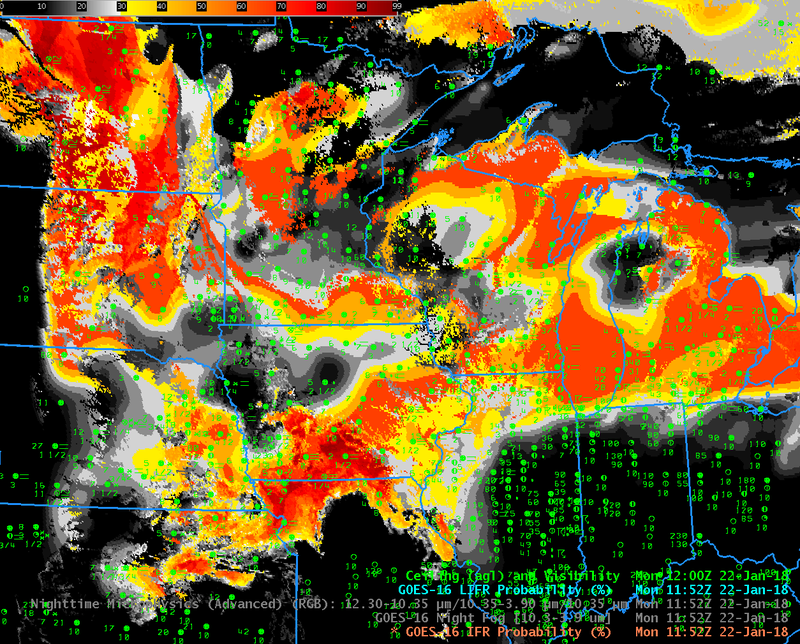 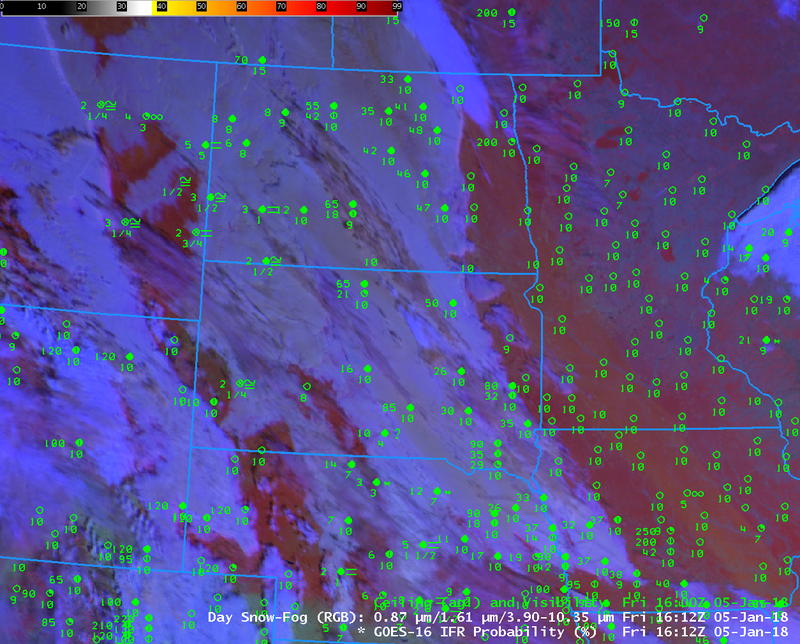 The stratus deck over Iowa and the eastern Dakotas shows much smaller values of Low IFR Probability. 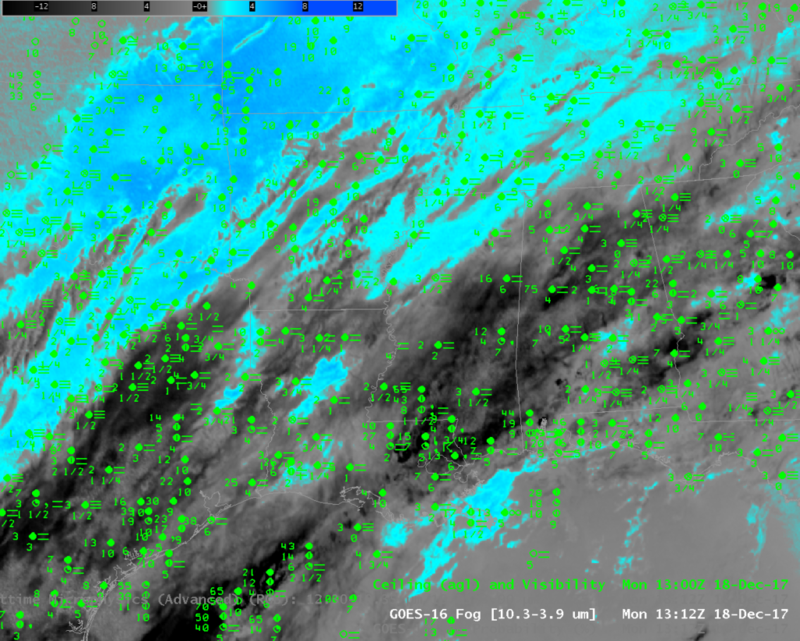 GOES-16 also has a ‘Fog Product’ brightness temperature difference (10.3 – 3.9) that has historically been used to detect low clouds. 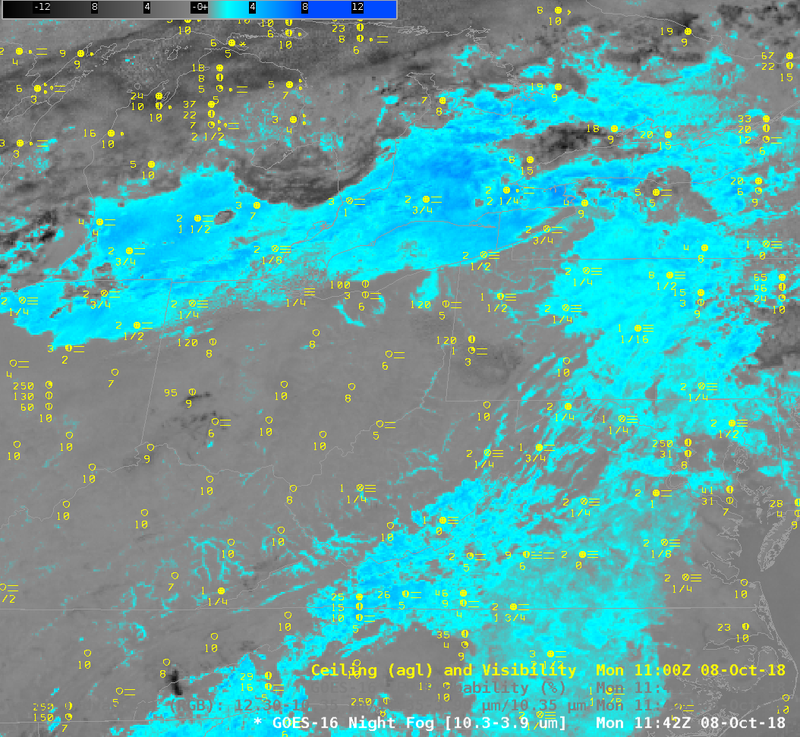 However, when cirrus clouds are present, as on 5 January, the efficacy of this product in fog detection is affected. Although fog and stratus detection is identifiable underneath the moving cirrus (the same is true in the Advanced NightTime Microphysics RGB product below), identifying the low cloud as stratus or fog from satellite data is a challenge because a consistent color married to IFR Probability does not exist. 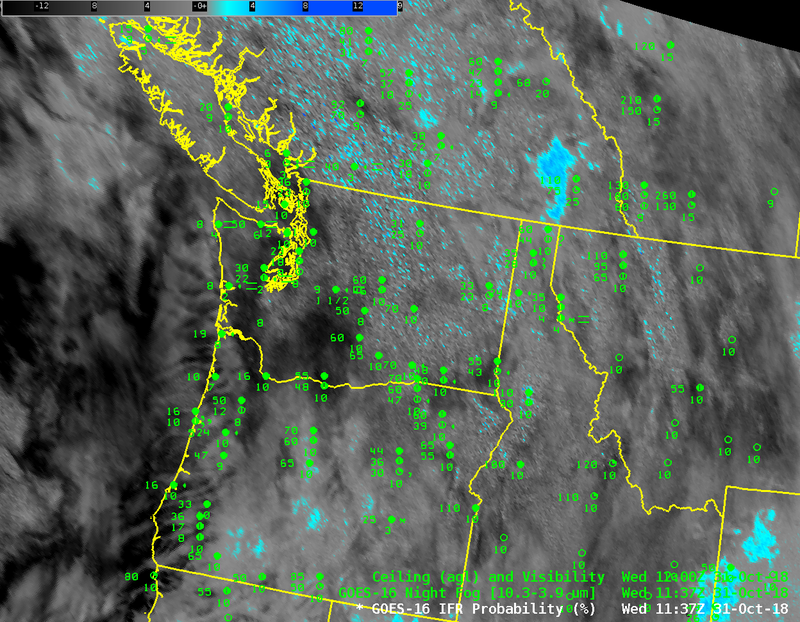 GOES-16 IFR Probability fields maintain a consistent look from night to day. Both the (10.3 µm – 3.9 µm) Brightness Temperature Difference field and the Advanced Nighttime Microphysics RGB (that uses the ‘Fog Product’ BTD) will change because the increase in reflected solar radiation at 3.9 µm will change the sign of the Brightness Temperature Difference field. There is a Daytime Day/Snow/Fog RGB Product in AWIPS, and the toggle below from 1612 UTC on 5 January compares IFR Probability and the Day/Snow/Fog RGB. As with the nighttime products, the presence of high (or mid-level) clouds makes it difficult to use the RGB alone to identify regions of fog/low stratus. 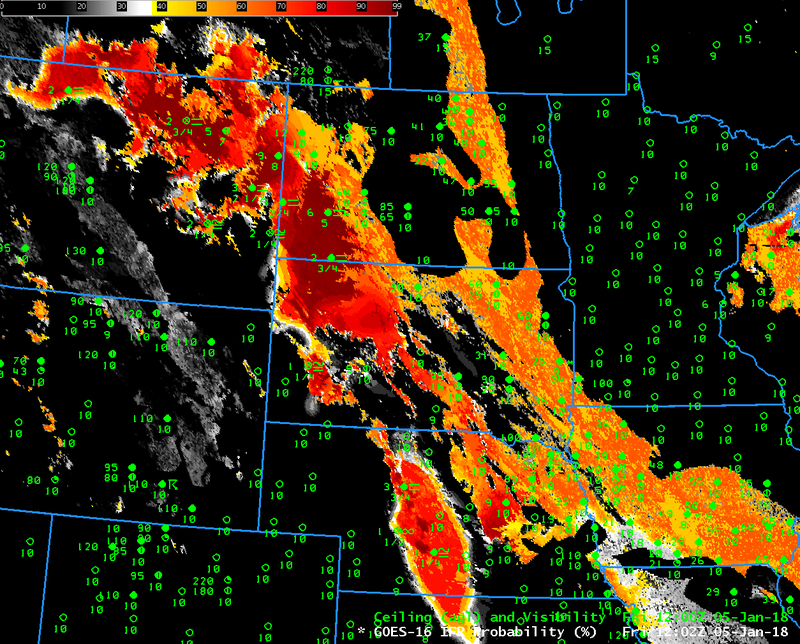 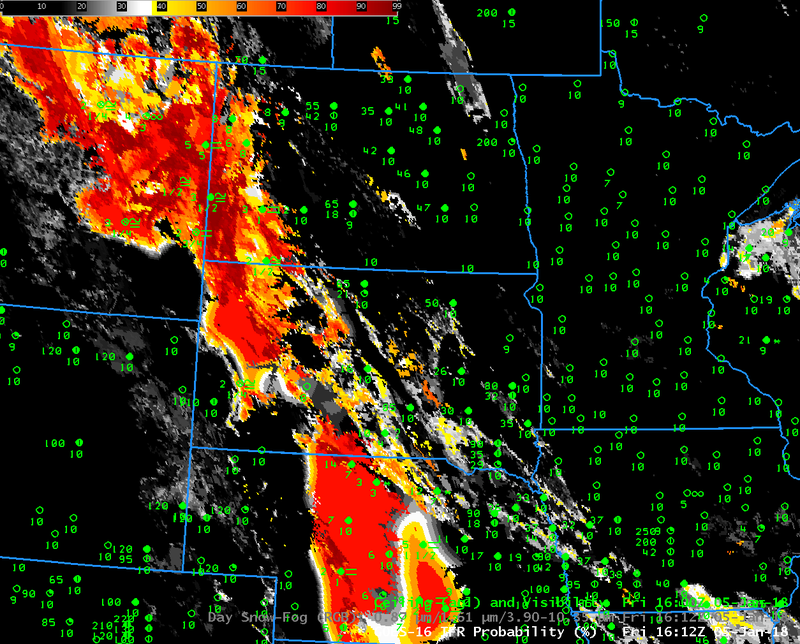 In contrast, the IFR Probability field continues to correctly identify where the obstructions to visibility exist. 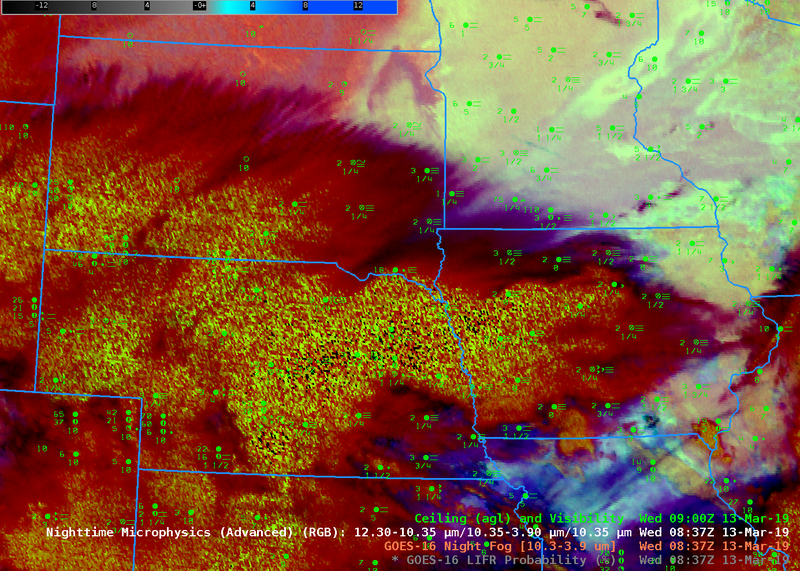 This entry was posted in GOES-16, Multiple Cloud Layers, Plains on January 5, 2018 by Scott Lindstrom.